Which is why we should eat more of it, but fish is not so popular in America. It is the stepchild protein to beef (the rich and successful sibling), chicken (the popular girl next door sibling), and pork (the confused one that can’t decide whether it is red or white). In Asia, however, it is a prized protein and eaten very often. Easily digestible, low fat, and quick to cook, it makes an ideal protein to feature on your dinner plate daily, if possible. Unless it’s frozen, you need to consume it quickly. Within three days is the Benjamin Franklin rule that pertains to your house guest too. Three days is not a long time, so you’ll need to plan to consume it quickly after purchase. Native to North America, over 80% of the lingcod caught in the US is rated as “best choice” or “good alternative” by the Monterey Bay Aquarium Seafood Watch program. Similar to sablefish or “black cod,” it is not actually cod. It is a bottom-dweller, found in ocean depth of 1500 feet or more, often hiding between rocks, cliffs or crevices. 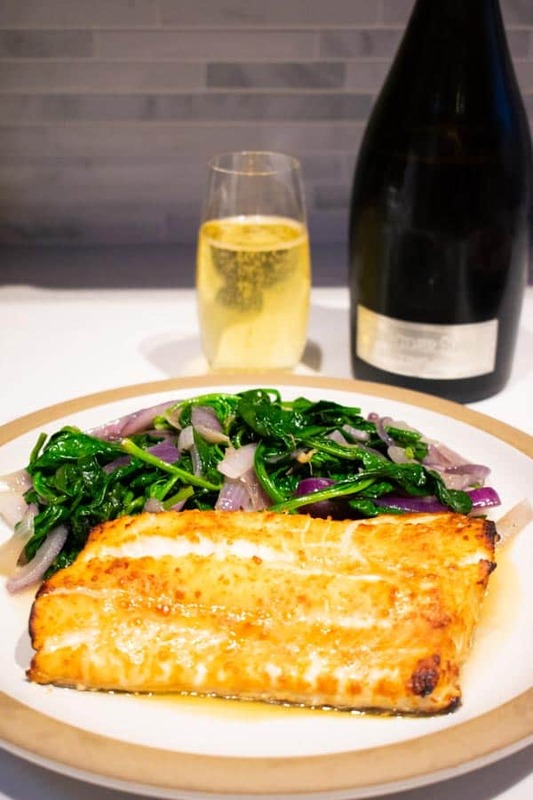 Whether you can find ling cod or not, any white fish fillet will do. Lingcod, however, is particularly thick, juicy, and has a large flake, which makes it ideal for deep-frying. They are caught off the coast of Half Moon Bay, CA and as far as the Farallon Islands past San Francisco. Lingcod, either whole or in fillets, is frequently available in Northern California farmer’s markets. The only question is, how to prepare it? 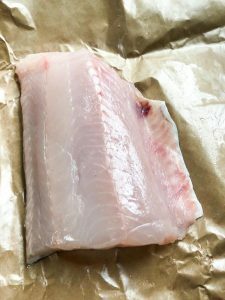 As a white fish, lingcod is particularly neutral in flavor and will take on the taste of whatever you put on it, like a blank white canvas ready to paint. This miso-soy glaze works adds depth and flavor beyond just salt and pepper and does so very quickly. Unlike miso marinated black cod, this takes just 15 minutes to marinate. Though if you forget about it, that’s ok. It can marinate up to 3 days in advance. Either white, yellow, or red miso paste will work. Use whatever you already have. If you have the skin on the fillet, be sure to score the fish with cuts about 1/2″ deep into the flesh. This will allow the marinade to penetrate through the skin and also keep the fish from buckling when cooked. It should take about 10-15 minutes to cook through, depending on how thick your fillet is. A tail end fillet would quick more quickly, since it is much thinner. If using a thermometer, it should register at least 145 degrees. This fish will dry out if overcooked, so take care to just cook the fish through for maximum juiciness. If you start seeing white cream oozing out of the fish crevices, it is starting to overcook. Remove immediately. 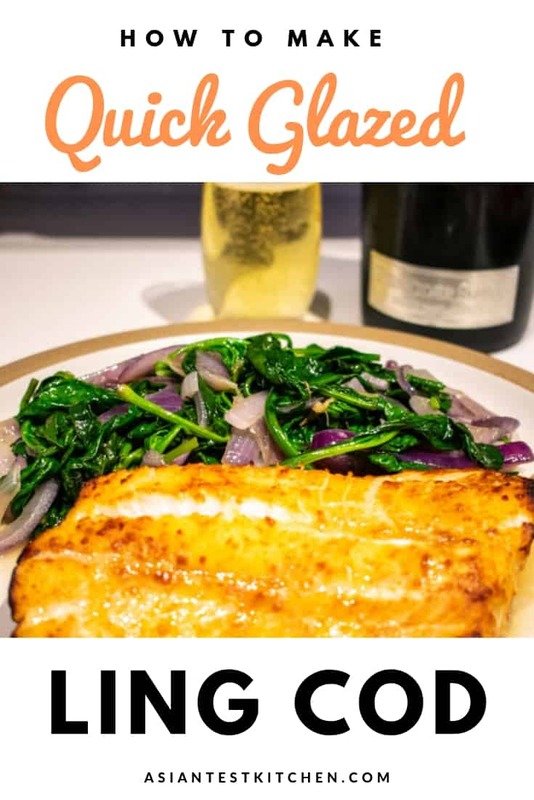 Baked lingcod with miso-soy glaze served with a sparkling riseling and sauteed spinach and red onion. 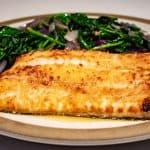 The next time you have lingcod or another white fish, try this easy miso-soy glaze that is only three ingredients. Published on October 22, 2018. Preheat oven to 375 degrees. Rack should be on the middle or upper third of the oven. 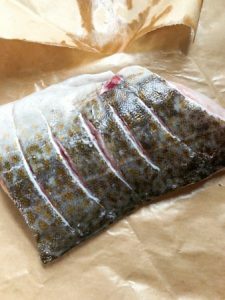 If the skin is on the ling cod, score the skin side with a few slashes with a paring knife about 1/2" deep. This will allow the glaze to penetrate through the skin and keep the fish from curling when cooked. Mix together glaze ingredients. 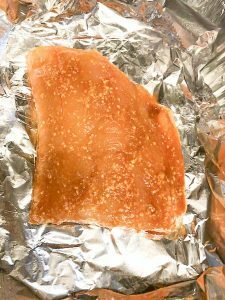 Rub onto fish and let marinate for 15 minutes. 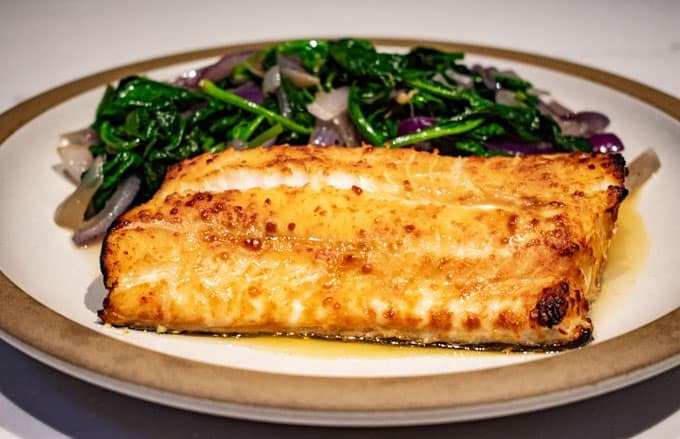 Place fish fillet on a baking sheet, lined with foil or not, and rubbed with a bit of oil or non-stick spray. Roast fish for 10-15 minutes until fish is cooked through or 145 degrees . Time will depend on the thickness of the fillet. Do you like fish? Please spread the Asian ♥ and share!